digitizing our cemetery records, adding a cremation urn garden, installing a waterline from the street to provide water stations within the cemetery, completing work on the historic vault, restoration of ironwork on historic family plots, erection of a roadway sign, visible from Route 20A, that identifies the location of Temple Hill Cemetery, improvement of the roadways in the cemetery, annually selling Christmas wreaths and placing them on the appropriate gravesites, sponsoring an annual fund drive to benefit the cemetery and sponsoring an annual “spirit walk” in the cemetery. Unfortunately, the income from the sale of gravesites and our fund raising activities is not always sufficient to cover the expenses associated with maintaining this beautiful setting. As a result, the Cemetery Association needs, looks forward to, and depends on the financial support from people like us. 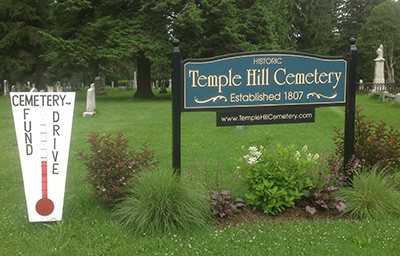 Should you wish to help with your financial support please write your check payable to Temple Hill Cemetery Association. Send it to Temple Hill Cemetery Association, P.O. Box 305, Geneseo, New York, 14454. Attn: Association Treasurer. Please be certain that your financial assistance is greatly appreciated.